My husband and I have been up to our eyeballs in insurance payments and costs these past few weeks. Our health insurance is up for renewal, we’re signing up for life insurance, and we had to update our car insurance when we bought a used car and sold one of our own cars. I always feel like insurance is one of those things that nobody really wants to pay for, but is absolutely necessary in case of an accident. But even if we’re required to have health insurance and car insurance by law, there are still ways to save money on insurance. These are the tips we’ve learned in the past several weeks on how to save money on the essential insurance policies. Buy only what you really need. These days, premiums keep going up even if you keep the same plan. It could be time to reevaluate your plan. For example, my husband and I used to have a PPO, but we switched to an HMO due to cost savings. Switching to an HMO saved me a lot on prenatal healthcare costs this past year. I paid $0 out of pocket for all my maternity care. Now that we’re welcoming a new addition in our family, we want the freedom to visit any doctor we like, so we’re switching back to a PPO. Oftentimes, employees overlook their health plans and keep the same one year after year out of convenience. They don’t realize they may be able to get a better deal by switching. Perhaps your doctor is in the HMO network. Switching to an HMO could save you hundreds, if not thousands, a year on health costs. Expecting our first baby, we decided we needed to have life insurance should anything happen to one (or both) of us. Of course, no one ever hopes to need life insurance, but it’s good to have in place just in case. Use an insurance broker to help you find the best rates for life insurance. They’ll also help you figure out whether term or whole life is a better option for you. It’s a significant cost savings to have term life insurance vs. whole, especially because you really shouldn’t treat life insurance as an investment vehicle. But talk to your insurance broker about the best option for you. We recently purchased a used vehicle and found we ended up saving more than $200 every six months on our car insurance premiums when we sold our other car. I didn’t quite understand because the used vehicle was seven years newer than our old car, was bigger, and also worth more. However, the vehicle we sold was considered a sports car due to only having two doors. Turns out we’re actually saving money just by purchasing a more reliable car. Again, talk to your insurance agent about how to save money on your car insurance. A lot of factors go into calculating your rates (including your zip code), but your vehicle can also make a big difference. If you’re in the market for a new car, check with your insurance agent as to what kind of car will offer you the most insurance savings. 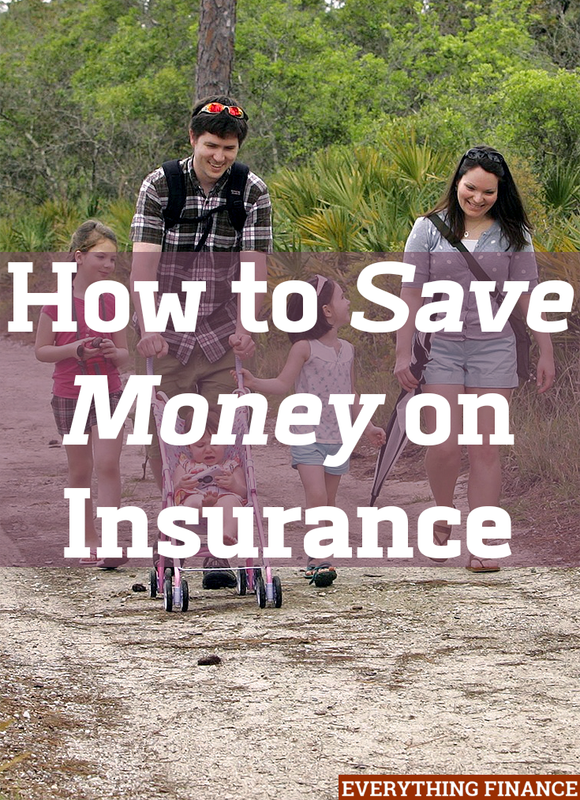 How do you save money on insurance? Do you shop around and re-evaluate your policies at least once per year?